Daniel Peralta Casanova is a graphic designer, typedesigner and teacher in Santiago de Chile. He has worked as graphic designer at different offices. 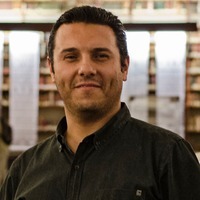 In 2012 he is a graduate in Design of digital fonts at the Universidad Católica de Chile. Currently teaches Typography and Information Design at Universidad de las Américas, DuocUC and Inacap in Santiago de Chile.